Arun Jaitley, the Finance Minister of India and the Chairman of Goods and Service Tax (GST) re-proposed GST – the indirect taxation system in the year 2016 under The Constitution (One Hundred and First Amendment) Act 2016. The idea was to bring in all the different kinds of taxes into a single taxation system. This is reckoned to be one of the most important tax reforms post-independence. The GST Council consisting of representatives from the centre as well as the states, after being constituted, met on several occasions to discuss various issues including dual control, GST laws, exemptions, thresholds, rate structure, compensation cess etc. and reached consensus on the same. After the GST bills were passed in the parliament on 29th March 2017, it was announced that implementation of GST will become effective from 1st July 2017 which will lay a clear road-map for India’s taxation system. GST will help get rid of multiple taxes levied at Central, State, and local levels ensuring uniformity across the country. The most recent eight-hour long debate in the parliament rose several concerns such as inflation and many more impacts of GST on the Indian economy. The Finance Minister however, has assured no inflation whatsoever. Exports and direct tax like income tax, corporate tax, and capital gain tax will not be affected by GST either. 1) CGST (Central Goods and Service Tax) – Taxes collected under CGST will be the revenue for the central government. Present central taxes like central excise duty, additional excise duty, special excise duty, central sales tax, service tax etc. will fall under the purview of Central Goods And Service Tax. 2) SGST (State Goods and Service Tax) – A collection of SGST will be the revenue for State Government. After the introduction of SGST, all the state taxes like Value Added Tax, Entertainment Tax, Luxury Tax, Entry Tax etc. will be merged under SGST. For example, if goods are sold or services are provided within the State then SGST will be levied on such transactions. 3) IGST (Integrated Goods and Service Tax) – Revenue collected from IGST will be divided between Central Government and State Government as per the rates specified by the government. IGST will be charged on transfer of goods and services from one state to another. Import of goods and services will also be deemed to be covered under inter-state transactions and so IGST will be levied on such transactions. For example, if goods or services are transferred from Karnataka to Maharashtra, then the transaction will attract IGST. 4) UTGST (Union Territory Goods and Service Tax) – Under this bill, SGST kind of a tax cannot be levied in a Union territory without Legislature. 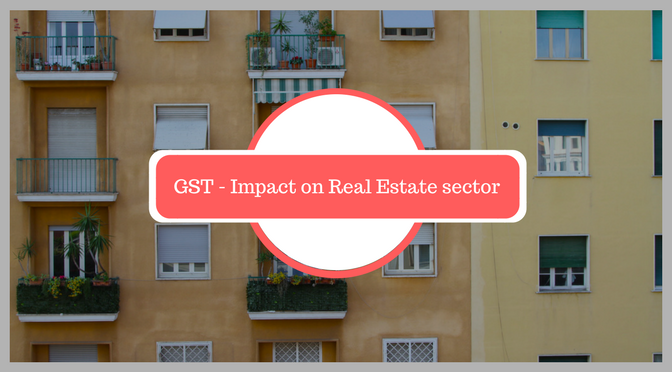 What GST means for Real Estate industry? Any lease, tenancy, easement, license to occupy land will be considered as the supply of service. The GST bills provide that sale of land and the sale of a building except for the sale of under-construction building will neither be treated as a supply of goods nor a supply of services. Thus, GST can’t be levied on those supplies. However, stamp duty will be applicable on these transactions as earlier. CGST does not subsume electricity duty and it will continue to be levied by the respective state governments. GST might be good news to a new home buyer even if they have to pay slightly more in case the standard is high as it minimizes the scope for double taxation. Since buyers are not liable to pay any indirect tax for the purchase of ready-to-move-in properties, the impact of GST on buyers of resale properties is likely to be very little. In the case of under-construction property transactions, buyers have to pay value-added tax and service tax. While VAT is a state levy and its rate differs from one state to another, service tax is a central tax charged at 15 percent. Overall, the current taxes on home purchase are not low and involve mind-boggling complexities. In most cases, buyers do not carry out a detailed study of the various taxes that they have to additionally pay and they make their investment plans based only on the value of the property. In the case of VAT, for example, there is little clarity on what amount is paid at which level, and what part of it is passed on by the developer to the buyer. Unfortunately, no amount of research helps the buyer know the right rate. Lengthy government documents are mostly interpretative in nature and if you are not a professional chartered accountant, you might get lost in the study, and yet get a little success. On the other hand, if there is a clear uniform rate for one tax that includes everything that they need to pay in taxes to authorities, the whole payment process would become very convenient for the buyer. In such a case, even a higher rate would be more acceptable to him than a lack of clarity. Why Will Developers Love GST? Since the GST is expected to bring down the project cost for developers, this would mean homes would, in fact, become cheaper. There are many taxes and duties that a developer pays on the procurement side, such as Customs duty, Central Sales Tax, excise duty, entry tax, etc. These are subsequently passed on to the final pricing of the units and, thereby, to the buyer. As GST proposes to roll multiple taxes into one, the cost of construction will decrease. This will bring more liquidity into the market and boost home sales. Free flow of credit for developers will also translate into an increase in margin in their hands. On the hind side, real estate experts feel in case of a negative impact of the GST on the sector, it may derail the Modi government’s flagship programme which aims to provide housing to all by 2022 in the urban areas.